British pundit dared to use the words "moral depravity" and "savages" alongside the word "Arab." 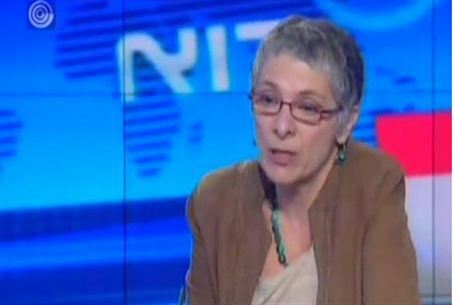 A scathing column by British pundit Melanie Phillips on Western silence regarding the murder of Jews has caused British Muslim groups to file complaints with the police. In the column, which appeared in The Spectator after the massacre of the Fogel family at Itamar, Phillips wrote that "as anticipated, the moral depravity of the Arabs is finding a grotesque echo in the moral bankruptcy and worse of the British and American ‘liberal’ media – a sickening form of armchair barbarism." Phillips lambasted the New York Times for a piece that blamed Israel for throwing "already shaky peace efforts into a new tailspin" when it decided to build 500 housing units in Judea and Samaria after the Itamar massacre. "So to the New York Times, it’s not the Arab massacre of a Jewish family which has jeopardized ‘peace prospects’ -- because the Israelis will quite rightly never trust any agreement with such savages -- but instead Israeli policy on building more homes, on land to which it is legally and morally entitled, which is responsible instead for making peace elusive. Twisted, and sick," said Phillips. The Guardian and the Independent claimed that police had opened an investigation against the Spectator over the column, the Spectator's Fraser Nelson denied this. Two Muslim advocacy groups have filed complaints with the Press Complaints Commission and the Bedfordshire Police, Nelson claimed, but the case has not gone any further. A piece on the Commentary Magazine website quoted Nelson but noted cynically that even though police do not seem to have opened an investigation, the complainants have gotten what they wanted. "The advocacy groups have already succeeded at portraying a fairly unobjectionable Spectator column as Islamophobic, thanks to the compliance of the British media."